Just a few weeks ago, I put up an article about 6 saltwater fish that fight. I wanted to write another article today about an upcoming trip where we will be doing some inshore fishing. I have been doing to a little research for our upcoming trip next year and started to looking into some fishing trips. We have been on many charters but have never taken an inshore fishing trip. So I think that’s exactly what we will do. To share a little on my thinking of these specific fish selected below, I focused on where we would be taking our trip. We will be taking an Navarre, Florida fishing charter. Today, we will go over four types of fish that can be targeted, so let’s get started. Found in the Atlantic Ocean and the Golf of Mexico, Redfish goes by many names. Some common names are, Channel Bass, Puppy Drum, Red Drum and as mentioned above, Ocean Perch. At one point in the 80’s, laws had to be put into place to protect this fish from being over targeted. Since then, the Redfish has made a big comeback and are now legal to fish again. However, most if not all states have low bag/size limits on this fish. You can find and fish Redfish in the Atlantic Ocean and Golf of Mexico. You will find them in shallow waters with on the edge of bays and in vegetation. The Redfish is a very tasty fish. They have a sweet mild flavor with large moist flakes and a firmer meat. They are commonly described as comparable to the Red Snapper. Though Redfish are edible in larger sizes, many people prefer them in the 15 pound range. It is noted that this fish may start to get more “gamey” as they grow past that weight. Though not in the same family as trout, the Speckled or Spotted Sea Trout carries its name because they look so closely aligned with river trout. Speckled Trout are actually a part of the Drum Fish family. This fish is plentiful, mostly due to fishing regulations. Many states do not allow gillnets to be used when fishing the Speckled Trout. This being said, most of this species are caught using line and lures. Speckled Trout is not a huge fish. 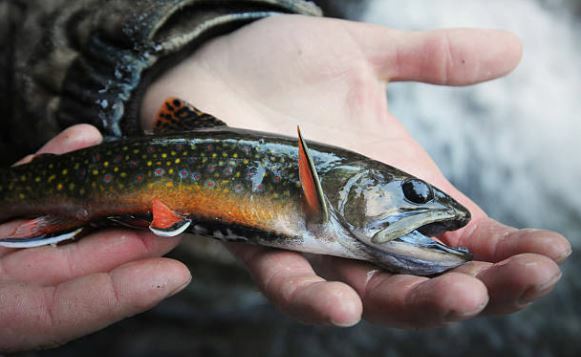 Normal caught weight of the Spotted Trout is between 1-5 pounds. Anything over 8 pounds is pretty rare with the world record being around 17.5 pounds. These fish are found in the Golf of Mexico and the Atlantic Ocean. This species of fish has a long spawning season which contributes to their plentiful population. It ranges from spring through the summer. During this time, you can find Speckled Trout in shallow bays with plenty of sea grass or other heavy vegetation. After Spawning season and when the water temperature starts to drop, these fish move into deeper waters throughout the Atlantic and Golf. This fish has small flakes with a meaty texture and has a briny flavor. Flounder comes in many sizes and colors. Actually, Flounder is a generic name for any flat fish. They are very common in many waters. Flounder are known to be the camouflage master. They are flat with two eyes on top allowing them to stay on the bottom of the ocean always searching for food. The upside of this fish blends in with its surrounding making it hard to see by predators. 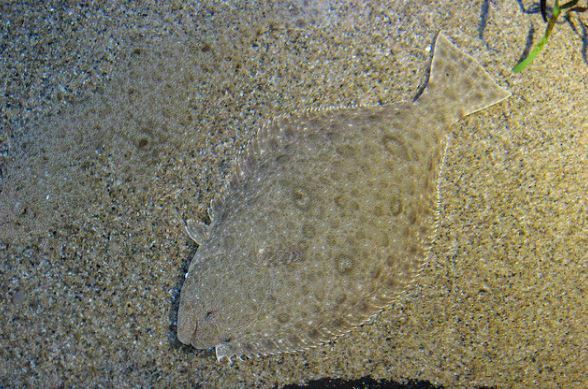 The underside of the Flounder is mostly pale or colorless. The size of Flounder can very since it shares the name with all flat fish. The Florida state record is 20.9 pounds to give you an idea on size in the U.S.. Flounder can be found in many different places in the United States. From the Atlantic to the Pacific and pretty much anywhere in between. They can be found offshore and inshore. The flavor profile of Flounder is a mild sweet with small flakes and thin meat. I’m sure you have seen the viral video of the man catching a Tarpon off of a dock by hand (video above). Tarpon can be aggressive and are fun catch. Tarpon is an air breathing fish that is part of the Megalops family. They are silver and shiny with scales covering the whole body besides it’s head. This species is a sought after fish for anglers that is known to put up a great fight. The common size of Tarpon can range between four to eight feet long ranging in weight from 60 to 280 pounds. The world record Tarpon is roughly estimated at just over 300 pounds. The Tarpon species has a wide range in the ocean but mostly found in the tropical waters of the western Atlantic. In the U.S., thy can easily be found in the Golf of Mexico and Florida. Though Tarpon is edible, they are mostly fished for sport only. Tarpon is a very boney fish that is hard to clean. There is also not a big market for the taste of Tarpon. In the end, there are many other fish you can go after when inshore fishing like Sheephead and Jack Crevalle among many others. The above species I covered above are the ones I have been researching. I believe we have narrowed our choice down between Tarpon or Spekled Trout. I believe we will have a great time wither way.